The Ultimate Bat Halloween Party! 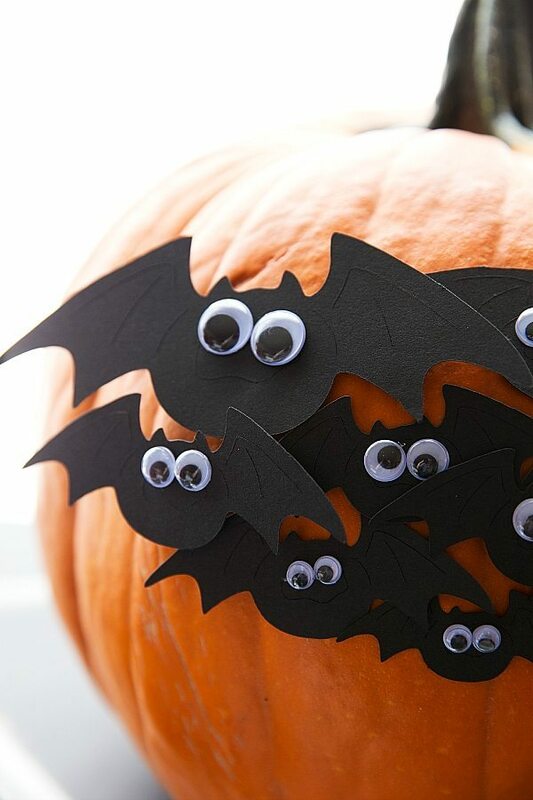 3 Super Simple DIY Bat Halloween Decorations to throw the ultimate “bat” Halloween party! You were all warned about my Halloween obsession 🙂 And so it continues! I am SO excited to share this post because it was an absolute blast to put together. Plus, it’s a little different than my typical post which includes a single recipe. 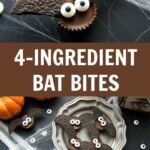 Today I’m sharing 3 super simple and festive Halloween “BAT” ideas. Fill up a plastic bag with the store bought or homemade frosting. Cut off the tip of the bag and pipe frosting onto the back corners of the broken cookie pieces. Pipe frosting on the back of the edible eyes and secure on top of the center of the Reeses cup. My 2-year old went nuts over this project. He manned the Cricut machine and cut out every single bat you see here. He loved pressing the buttons! After cutting out about 10-15 bats, he didn’t need any help knowing what to press to continue cutting them out. If you don’t have a cricut, these bats can be hand-cut out using these templates (<–click to get to a pre-made template). But if you do have a cricut or similar machine, it will go a bit faster. Cut out lots of black bats in varying sizes. If you use the templates and scissors to cut out your bats, you may have to google search a few more templates to get all the different sizes that you want. Once the bats are cut out, hot glue on the eyeballs. Then use the hot glue gun to attach the bats to the pumpkin. (I did the larger bats on one side of the pumpkin and the size of the bats decreased across the width of the pumpkin.) The miniature clothespins can be hot glued to the back of some of the bats to give different “heights” to the bats. This is optional, but gives the pumpkin a little bit more dimension. So cute right?! And seriously easy to do! Okay and finally we are to the third Bat decoration for your ultimate Bat Halloween party: A DIY Creepy Bat Tree. Using the black construction paper and a cricut, cut out lots of black bats in varying sizes. If you use templates and scissors to cut out your bats, you may have to google search a few more templates to get all the different sizes that you want. Hot glue on eyeballs on the bats. Cut the foam block to fit inside your vase or pot and hot glue to the bottom. Insert your branches into the foam block. Pack everything in with brown packing paper (or newspaper). Hot glue gun the moss to the paper. Hot glue the bats to the branches. To get some of the bats to go a certain way you may need to use the clothespins. Hot glue the clothespins to the back of the bats and then attach to the branches. Chelsea, these are all so cute! Funny, I was just on Foodgawker and saw the picture of the Oreo bat wings and instantly knew it was your photo before looking at who posted! Gorgeous and fun! You are so sweet!! Thank you Danielle!! 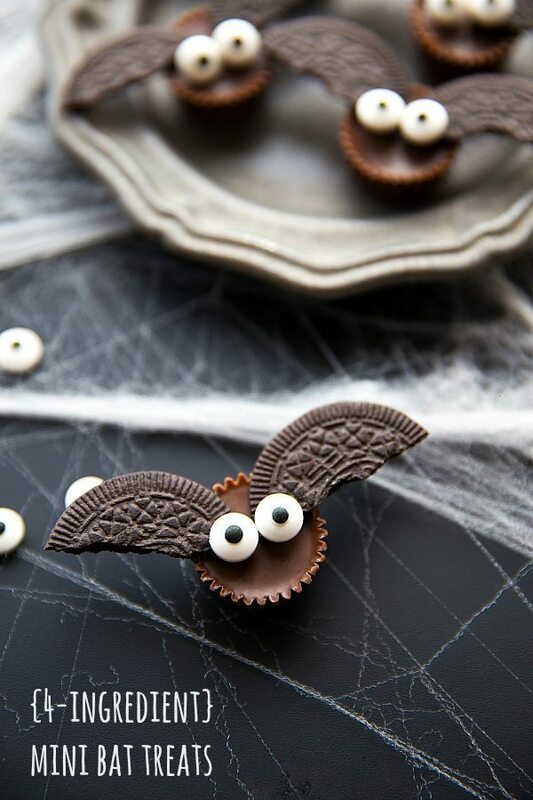 I am obsessed with these bat chocolate bites. Though we don’t really celebrate Halloween here in Australia – I have to make them!! 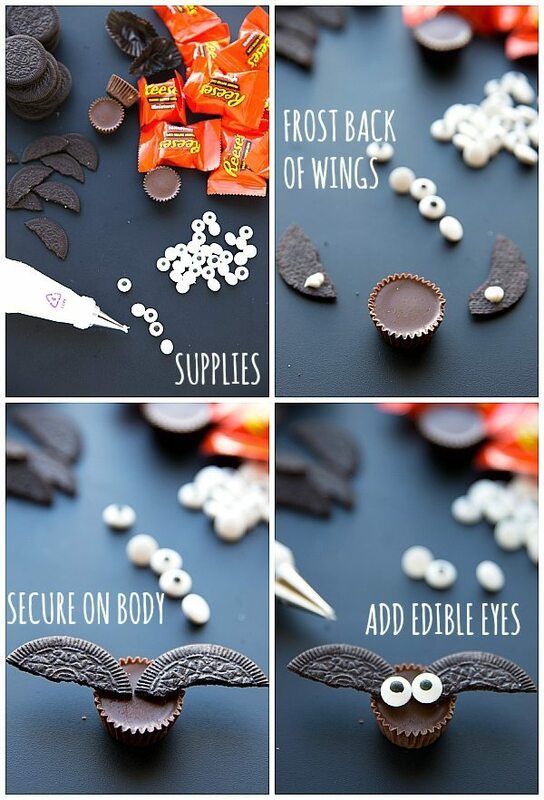 These Halloween ideas are so adorable. I think the bats made with peanut butter cups and Oreos are my favorite. cute ideas! Where wOld I find edible eyes? Took these bats to our harvest supper last night. Made a big hit. Here is my problem….. I would love to have my grand daughter help make the Bats made with the peanut butter cups. But they can’t be used because of possible peanut allergies…. any suggestions for a substitute? You can make your own “peanut butter cup” base and instead of putting in peanut butter you could use something like cookie butter. Here’s a recipe if you want to try that out: https://www.chelseasmessyapron.com/cookie-butter-crunch-cups/ Enjoy! These look yummy and cute! If you have other kid-friendly craft tutorials, we’d love for you to submit them. If you would like to display a featured button on your site, you can get one from the right side bar of your post above. Thanks for a cool idea! 4 start only because the cookies were slightly difficult to cut. I wanted the wings slightly smaller than the instructions say, which is to cut them in half. My husband ended up cutting/sawing out a little in the middle. I also used left over melted white chocolate, from chocolate covered strawberries, to “glue” the wings and eyes on my bats. Would totally make them again! Huge hit for church refreshments!! Thank you for the super cute idea!! ??? The mini bat treats are amazing. I made these last year but cut the biscuits using knife. They did not look as appealing as yours. Seems like imperfection is what makes it perfect. 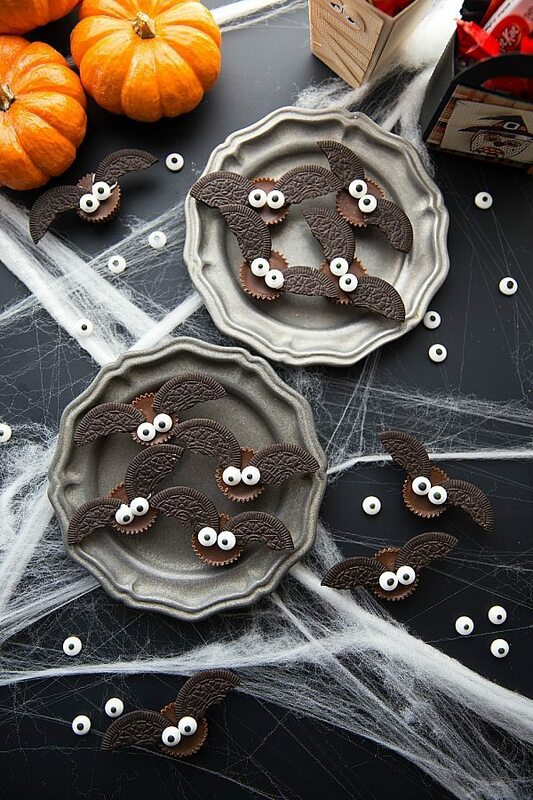 such creative ideas, loved Mini Chocolate Bat Bites, thanks for sharing.